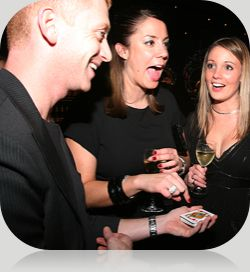 Adam Keisner is a London based, award winning Close-Up Magician and Sleight of Hand Artist specialising in Close-Up Magic with cards, coins and borrowed objects. Finger rings, bank notes, pens, watches, rubber bands, napkins, bottles, glasses and cutlery. Basically common familiar objects, which can always be examined prior, during and after the show. 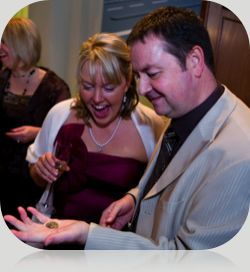 Booking a good Close-Up Magician adds a unique form of entertainment to any social event, helping to break uneasy silences and allowing your guests to interact. 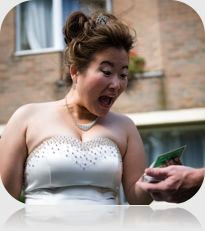 Close-Up Magic is the perfect icebreaker for formal occasions, social events or just plain mix and mingle. As a one man act with a huge repertoire of magic all my props are self contained in my pockets or borrowed ready to go anywhere at anytime throughout your event. I don't require a specific performing area and I can stop and start at a moments notice. I'am a full time pro with over 12 years performing experience.Magic is my full time job.Sixty percent of my work comes from repeat bookings. Corporate clients have flown me to Dubai, Iceland, Portugal, Brussels, Spain, Italy, Switzerland and Kuwait. I've also won awards for my magic from the Magic Circle and the annual International Magic Convention. Above all it’s my living and what I love doing. If you'd like to hire me as a Magician for your event then probably the main query you have is how much do I charge? 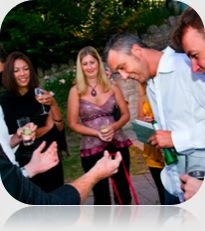 Times, date, location and duration of performance will affect the total cost so If you are keen to make an enquiry for me to perform Close-Up Magic at your function then please either use the contact form or email me at adam@keisner.com Alternatively feel free to call me on 07968-810-007 to discuss further. 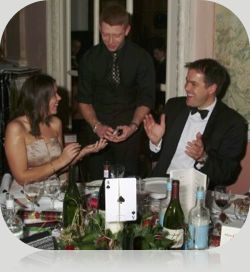 As a London based Close-up Magician I go to hundreds of different types of events and equally many venues in the course of one year. 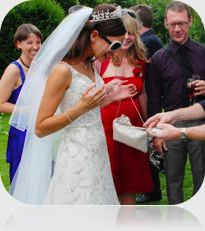 Although from Clapham, South West London I frequently work all over the London area and the surrounding counties too. Berkshire, Buckinghamshire, Essex, Hertfordshire, Kent, Middlesex, Surrey, Sussex (East) and Sussex (West) are just a few of the many different locations I cover on a regular basis and as I drive it's never a hassle to get to your event. 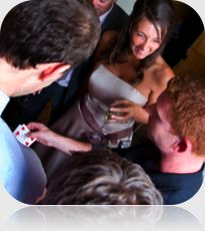 If you're looking to hire a professional Close-Up Magician to entertain as a Magician for your Wedding or to perform Table Magic at your private party then please inquire.